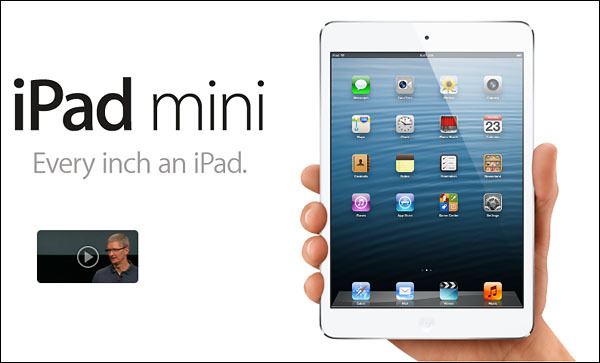 Apple Inc. unveiled the new tablet half the size of the existing iPad called "iPad Mini" on Tuesday, Oct. 23, 2012. Measured diagonally at 7.9 inch, it is obvious that it is aimed at competing with Kindle Fire and Google's Nexus 7.
iPad currently is the king of the tablet world, and it is evident the Mini iPad is made to dominate the 7-inch segment of the fast growing tablet market. Not really a 7-inch tablet but looks easy on the hand. The rounded edges reminds you of the iPhone 3G. Thickness (or rather thinness) is 7.2mm and weight is 308g. This means that the mini version is 23% thinner than the big iPad and weighs at half of the bigger sibling. The volume and screen-rotation lock buttons have moved to the right-hand side. Not a big deal to me, just a bit of getting use to. The 7.9-inch display is LED-backlit. Because it is at almost 4:3 ratio it looks more squarish when compared to the bigger iPad. Screen resolution is 1024x768 at 163ppi which is similar to that of the iPad 2. Check out the picture below. Main camera is iSight 5MP similar to the one on iPad 3. There is stabilization on video camera so it should be easier to take picture. Taking picture with the iPad 3 is easy, I expect it would be better with the smaller iPad. Announced as up to 10 hours of surfing the web on WiFi, watching video, or listening to music. If you are on cellular data network, you can surf up to 9 hours. Of course, these are always based on ideal conditions but with my current iPad 3, I'm happy with the battery performance. The iPad Mini is using the A5 dual-core chip, similar to the one found in iPad 2. In comparison, the new iPad 3 is using dual-core A6X with quad-core graphics chip. Heck, who'll be able to tell how it perform if one hasn't even fiddle with the slab for at least a day or two. But the mini is loaded with LTE which means faster communication through 4G network (in selected countries). Don't put your bet on that to happen very soon in Malaysia though. We have 4G here but there is still that nagging compatibility issues. For gaming and ease of use, you will have to wait for early adopters to come out with their comments. While it is too early to hand down a verdict, there is one obvious reason why people would pass this one: Prices are way too high! Base model starts from $329 / £269 (possibly RM1,299) and the top end 64GB WiFi + Cellular will set you back $659 / £529 (possibly RM2,599). It's a big hindrance as Google's Nexus 7 is only $199 (RM600) and Galaxy Tab 2 (7.0) at RM1,299. I am comfortable with my iPad 3, with the 9.7-inch display being just what I need to complement my smaller smartphone. I think I'll keep my saved cash for a newer iPad. 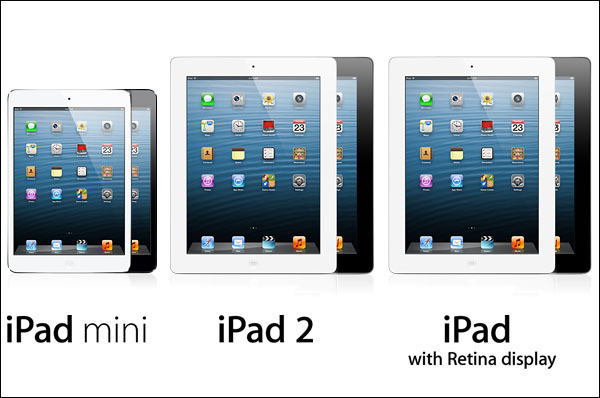 Scaled comparison of the iPad Mini with the bigger siblings. Malaysia prices? Check this site again soon, we'll make some interpolation and put our best prediction for Malaysia market.